Just watched an episode from 1971 called Safety First and I noticed this ad on the bus for a shop called The Music Box Billericay I just wondered if anyone can remember a Dem or Coffee in said establishment probably long gone now. 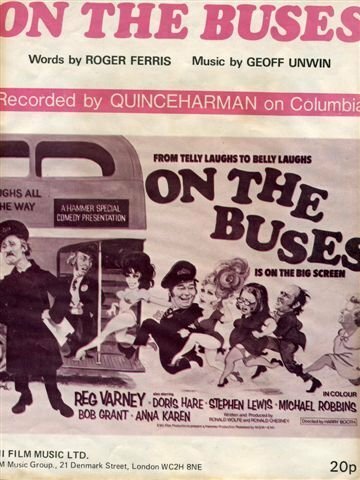 I can't believe that you have just admitted to the whole world that you watch "On The Buses"
My best mates brother Geoff Unwin wrote the music to one of the films. He also did work on the Beatles albums but never credited on the albums. Took us to Abbey Road studios years ago and George Harrison was cutting All Things Must Pass album. That's when I met the great Ravi Shankar. Clapton was also doing the follow up to Layla but they where so spaced out they couldn't cut it so they joined George and it ended up the third album Apple Jam on the triple album. The follow up to Layla was scrapped. Nice one - very cool. Quite a contrast - On The Buses and The Beatles. Just don't mention Arthur's Operation. Mr Onion wrote: I can't believe that you have just admitted to the whole world that you watch "On The Buses"
Didn't have time I was dragged out for the day it's our anniversary she bought me an album on Vinyl.its the last I posted on bought.